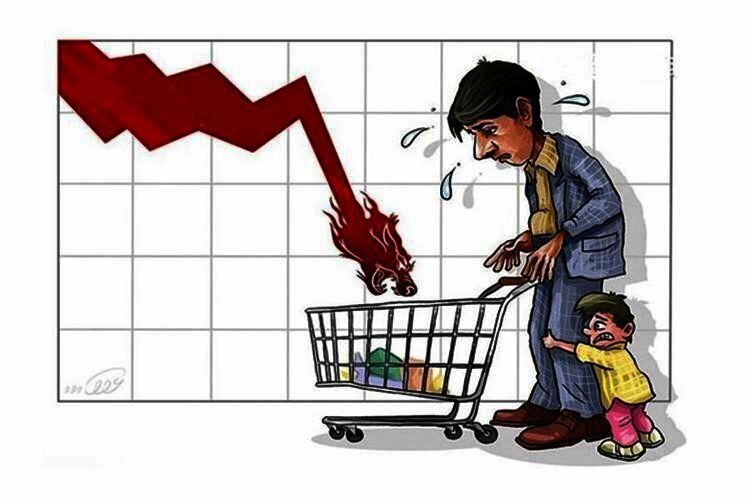 According to Iranian state-run media, Iranian officials are intentionally withholding statistics on inflation and the poverty level in fear of repercussions. Nevertheless, experts say that the sharp decline in the value of the Iranian currency and the rising inflation of essential commodities have led to a severe increase in Iran’s poverty level. According to Rohollah Babaie Saleh, a lawmaker in Iran’s parliament from Buin Zahra in northwestern Iran, the poverty line has reached 6 million tomans from the previous 3 million tomans. “Previously, the poverty line was below 3 million tomans, but this has changed with regard to the current economic situation in the country; the poverty line has now reached salaries of less than 6 million tomans,” he said in remarks carried by the state-run ILNA news agency. However, a report by Iran’s Parliament Research Center recently put the line of poverty at 3 million tomans for a family of four. Still many argue that the regime is not being straightforward when it comes to announcing inflation rate or poverty levels. Even state media have acknowledge a “statistical confusion” in the official inflation rates announced by the government. According to Faramarz Tofighi, the head of the Salary Committee of the Supreme Center of Islamic Labor Councils, regime officials deliberately create confusion on the line of poverty and inflation. “We have not seen any of the administrations officially announce the line of poverty”, the labor official said. “While relevant officials refuse to provide information on the poverty line, unofficial authorities provide different and sometimes contradictory statistics; we have so much of an information vacuum that data on the suitable food pyramid for Iranian households has still not been specified! The most basic component to determine the poverty line is the food pyramid that we do not have,” the labor official said adding that the issue was neglected like “thousands” of other issues throughout the years. Tofighi said that the reason behind the regime’s decision not to announce the vital economic statistics was “fear of the repercussions”. “The reason is because of fear of the consequences of statistical transparency, since announcing the poverty line can have a direct impact on many decisions in macroeconomic issues,” he said. “If the poverty level is formally announced, in line with what the constitution requires, in the next phase they have to work towards the eradication of poverty. They would have to consider the line of poverty while determining wages for employees and workers,” the head of the Salary Committee of the Supreme Center of Islamic Labor Councils added. The government’s calculated deceit has had a direct impact on ordinary Iranians. According to a municipal worker from the city of Nishapur in Razavi Khorasan Province, he now receives less than before despite skyrocketing prices. “Before this I received 2.7 million tomans since I had two children but in the new contract, my salary was reduced to 1.5 million tomans,” he said. Despite the highly confusing statistics on the livelihood condition of Iranians and the fact that there is no independent or credible institution that would present such numbers, widespread protests by various sectors of the society is a clear indication of just how dire their livelihood conditions are. Almost all of the more than 9,500 protests in 2018 were related to economic woes. Only in the last three months, municipality workers in at least 10 cities gathered in protest to not receiving their wages. Municipality workers in the impoverished southeast province of Sistan and Baluchistan and the southwest province of Kohgiluyeh and Boyer-Ahmad also held rallies in protest to not receiving two to eight months of their salaries.